Valters Zviedris with the team already returned home this week from Portugal, where at the Portimao track played CIK-FIA Autosport Academy of Stage 2. Valters competitions conducted its next and the main objective of this stage - entered the Top 10 and also completed a race high 10 th place, which is by far the best results for Zviedris 9-year athlete's career. On the 2nd stage of the competition as a whole it came to 47 riders from all over the world. Portimao track, which was built in 2009 turned out to be very complicated. It is 1531m long with a number of falls and rises, where to go to the mountain. After thursday's engine lottery, at friday's training Valters quickly got used to the track and his group demonstrated even numbers respectively 14, 9, 8 and 10 result. It was tested on different maps regulations, so workout results can be considered quite good. Friday's qualifying he was quick, but the rider from Jordan, troubled by two potentially fastest Valters on flying laps and he qualified 11. place in group and it gave the 22. place in the table after the qualification runs. Saturday afternoon Valters spent two pre-drives, which was well-deserved place on the starting sunday pre-final and final trips. The first of them Valters started from the 15th spot concluded in 12 and 10 instead, which gave 22 points and 16th place on start pre-drive journey. After each of these pre-drives Top 16 riders had to change the engine. After the first trip Valters reversed its raffled engine with riders from Norway - Emil Heyerdal and the second trip was to the table standings leader Callum Bradshow (UK) engine. Sunday, at pre-drive, which deserved place in the now final journey, Valters managed to climb whole five seats and the final drive on startup take 11. Position. Given the fact that after pre-final must change with engines Valters was distributed to our neighboring country representative Kasparas Vaskelis engine, which unfortunately was at which 0.3 seconds slower than the pre-final used. Thanks to this successful engine change Lithuanian rider for a long time was the final race leader and race concludes on the podium as the third winner of Wight. Valters succumbed to a good start and all the way along Valters fought 9 and 10 within the limits of the riders from Denmark, Spain and Belgium. Valters managed to overtake Spanish rider - Carlos mouthed and Denmark Hansen, but a few laps before the end of the journey from the Belgian rider - Elie Goldsetins, whose grandfather is a five-time World Champion karting, took over Valters and got 9th place for itself. 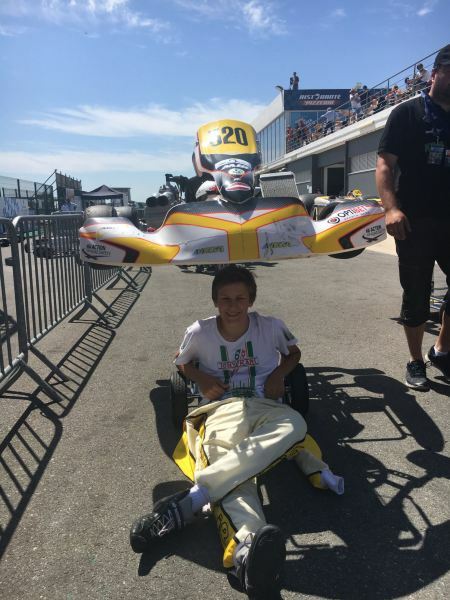 Valters Zviedris at finish reached 10th place, which is by far the best achievement at CIK-FIA Autosport Academy competitions. The third and the last phase of this series will be at 4 September in Sweden, sharpness Ring track near Kristinstadt town. This phase is associated with the greatest expectations as this track Valters has already started. Last year, 32 athletes competed on the Swedish stage of the Rotax Max Valters he won 6th place. Valters team believes, if lucky with the lottery engine and engine changes, the result of the Top 5 or even location the podium looks objective distance to downtown. This weekend saturday, Valters will start here in Latvian, Kandavas Kartodroms, which will take place Pro Kart Step 3. Valters aim of these competitions is a good preparation for the final stage of the Baltic Cup, which this track will take place in late September. Table standings after two stages Zviedris with 6 points currently ranks 19th place out of 51 riders of participants. We are proud of the achievements of Valters and keep our fingers crossed for a great start last CIK-FIA Motorsport Academy stage in Sweden. Thanks for spending time on the computer (wgrniti) so others don't have to. That ingtihs's perfect for what I need. Thanks!